Once upon a time long long ago………. Where stories unfold as dreams start to flow………. With a splendid knight’s sleep here at Minstrel’s Rest………. 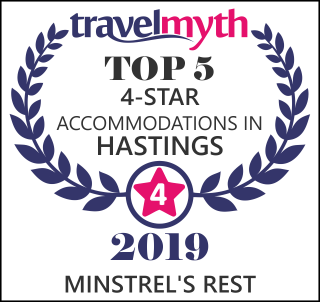 Welcome to Minstrel’s Rest our family run 4 Star award winning guest house conveniently situated within a five minute drive of Hastings town centre and seafront. All of our rooms are fabulously decorated and furnished in a medieval style, offering luxury accompanied with todays modern comforts. Minstrel’s Rest is the perfect place for both holiday and business guests to relax and explore the historic sites of Hastings and the surrounding 1066 country. Being just five minutes from the town and seafront comes with the added advantage of a peaceful and quiet environment, enabling a restful and tranquil nights sleep. You also have unrestricted FREE parking on our drive and in our quiet road. Tea/coffee making facilities, mini fridges with fruit juice bottled water and fresh milk, TV’s with freeview, an extensive range of complimentary toiletries and the softest most luxurious towels are standard features in all of our rooms. Our breakfast menu is varied, catering for all diets, using locally sourced produce and all home made jams and preserves. WiFi internet access is freely available in all of our rooms. We are fully licensed at Minstrel’s Rest and offer a range of our own Meads and Wines as well as bottled Real Ales, Ciders and Lagers, a selection of locally produced fruit and English wines, and of course a wide variety of Meads to keep you in the medieval spirit. We can also provide bottles of Champagne for that special occasion, all to enjoy either in the dining area or the comfort of your own room. Morgana and Lorelei our two cats live with us at Minstrel’s Rest. They are not allowed in any of the guest rooms but you may wish to consider this if you have any allergies.